HERE IS THE PROBLEM: You want your organization to be environmentally conscious, but you still need to get your message out. You have tried going the mass e-mail route, unfortunately, it is just not effective. Think about the number of e-mails that you get every day from various companies, now think about how many you actually open and/or read. Here is a secret — direct mail is once again the most effective and affordable means to communicate with customers and prospects. I will tell you why and how you can still keep Mother Nature happy. Typically, printing does not immediately come to mind when considering environmentally friendly industries. One conjures up images of massive presses using enough electricity to power a small town while wasting a forest full of trees and dumping ink into the rivers. Blue Dog Printing & Design is nothing like that. We operate all digital presses that are Energy Star certified. Every toner cartridge is returned in its original shipping container back to the manufacturer to be recycled. Of course we offer recycled paper. That option however, may not be the best fit for every project. Still, we insist that all of our paper suppliers are certified FSC (Forest Stewardship Council) compliant. This rigorous certification process requires that paper mills operate in a fashion that significantly limits their impact on the environment and replenishes the forests that are harvested for paper production. Since paper is a renewable resource, the effect on the environment does not need to be negative. Our primary supplier annually plants considerably more trees than they cut down. Ten years ago, your mailbox was stuffed every day with postcards, flyers, offers and “junk mail”. These days, many companies have scaled back their mailing programs in order to cut costs and appear “green”. You still go to your mailbox everyday. The result? More time to peruse those pieces that you do receive, and a greater chance that the piece will end up on somebody’s desk (not their deleted items folder). With Every Door Direct Mail (EDDM), a new program offered through the United States Postal Service, you can reach a specifically targeted geographic area. If your prospects are located in one area, we can reduce your cost, improve your return and keep you environmentally conscious with EDDM. To learn more about EDDM, visit https://eddm.usps.com/eddm/. Our doghouse is open M-F from 8:30AM – 4:30PM, so feel free to give us a bark and schedule an appointment to talk about your direct mail needs. 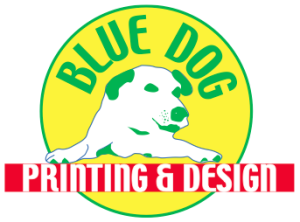 In addition to green printing, Blue Dog Printing & Design also offers a wide range of environmentally friendly promotional products.